I'm going to go ahead and throw this out there... lately it's been all about the running. For a good six months it was all about the breastfeeding, the pumping, the work traveling, the no-sleeping, the baby, etc.. But lately we feel most of that is "under control" (it's never under control but it has been much more predictable or maybe we are getting better at this parenting thing, eh?... until that next sleep regression hits that I keep hearing about). So, we're branching out and doing more running. Brad and I are also taking turns getting out of the house for solo runs - we all need our alone time! Since I'm feeling pretty rested now-a-days (did I mention we are getting 8-11 hour stretches at night?!) naturally, I'm getting excited about running more and I want to set some new goals for myself. Anyways, Beth became a USTAF Track & Field Coach back in January and I noticed because I stalker follow her blog. I reached out to her in the beginning of May and asked her if she'd coach me to my first marathon postpartum. Even after I told her about my crazy schedule and my crazy goals, she didn't hesitate to say yes. And I truly believe that's what I need right now... someone who can understand my momma-wife-work balance, still encourage me, believe its possible and help me reach my running goals. I mean.. 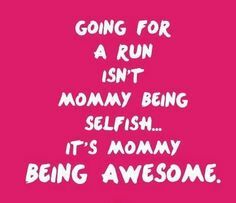 I can't be the first #workingpumpingtravelingmama to also want to train for a marathon.... right?! And let me clarify that Beth did talk me down from jumping off the marathon ledge. We are going to start with a half marathon in the fall and see how that goes. I mean only crazy people jump right into marathon training after having a baby (I apologize if I offend any of my 2 readers with that last statement) and I don't want to be a crazy person. I want to run a marathon but I don't want it to take me 8 hours to finish either. I want to be healthy, fit and as well trained as I can be considering most of my life constraints right now. Before Joanna, and this new job, and our move to Texas, and Brad's new job (...before EVERYTHING changed).... life used to be all about the running. And I just have to be honest with myself. Right now we're just trying to fit the running in where we can. So, Beth and I agreed - 3 runs a week. Sometimes it's my turn to push the stroller and other times I get to lace up my shoes and just run solo. However I do it, I just need to put in the effort, have fun and now I have someone who can hold me accountable. Because I need a plan! Ya'll know me (you like that Texas ya'll..? heh)... if I don't have a coach and a plan, I could end up running a marathon in Alabama, 6 months pregnant. And no one wants to see that. So if you've made it this far... go check out my new coach, Beth. She has a pretty cool space on the internet and she has lots of great recaps of her past races. No one is born a runner and when you read her stuff, she reminds you that we all have to work at it. We all start at 0.0 and achieve our goals with a little bit of hard work and lots of fun along the way. We've been working together via email (she's in Florida and I'm in Texas) and via TrainingPeaks.com for the last several weeks and I'm really enjoying her feedback, encouragement and coaching style. You're a joy to work with & I admire your dedication to maling it work. It's tough to fit it all in & you are rocking it!